Get a jump on your New Year’s resolution to stop brown bagging it or paying too much for lunch out, and enter to win one of these fun and environmentally conscious bento lunch box sets! We actually won a set of EasyLunchboxes in a giveaway (so I’m here to tell you it can be done! ), and Mikko was excited to immediately put them to use for picnics and snacks out. Since Mikko was three at the time and in only a half-day preschool twice a week, and since Sam and I worked exclusively from home, we didn’t need them for traditional purposes perhaps, but they still came in handy, and do even more so now. Sam now works part of the time from an outside office and has to bring his own sustenance since there’s no other possibility within walking distance. 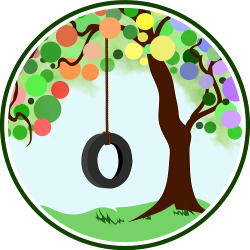 We also take turns bringing our (now) two boys out for excursions, and it works well to bring along healthy and kid-approved food to eat. 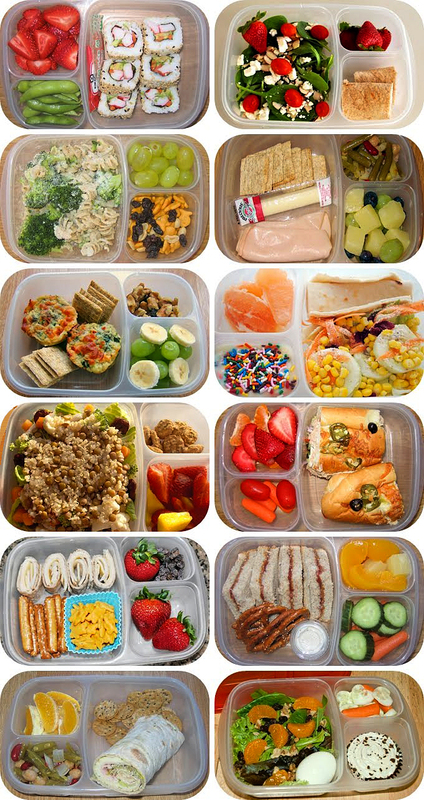 The containers are so much better quality than those disposable brands (read bento bloggers’ unsolicited opinions here!) – a very sturdy polypropylene. Each is subdivided into three compartments, so you can get your bento on. We don’t get all that fancy — here are some crackers, hummus to dip, and some yummy cheese slices. No matter what you put in them, you’ll know you’re giving your family the benefit of your healthy, homemade meals — and saving money to boot! You’re also creating less waste by opting for a reusable lunch container over plastic baggies, and portioning out your own family-size foods and leftovers over store-bought single-serve items. While the containers are not watertight (to allow for ease of opening by little hands), we’ve had no problems storing things like hummus, salsa, and other (not-too-runny) dips inside, as long as we carry the containers in the cooler bag. This means that, unlike with reusable fabric baggies, EasyLunchbox containers can hold wet food items (dip, fruit, yogurt, etc.) without a problem — and cleanup is a snap in the dishwasher! There aren’t any funky crevices for food detritus to hide. I also like how fragile food items are kept safe by the hard-sided container. Chips and crackers stay whole. Sandwiches and breads don’t get squished. The site warns that eventually the hard containers will crack and need replacing. Ours haven’t worn out yet, in the year we’ve been using them, but it’s worth mentioning that they’re not intended to last forever, so have an extra set on hand if you use them frequently. The cooler bag keeps items — well, cool! It also helps protect from spills, and you can machine wash it on the gentle cycle if food goes astray. Again, unlike with fabric baggies I’ve also tried, the EasyLunchbox system has the advantage of keeping foods fresher: Fruit and veggies stay crisp longer; chips, cookies, breads, and crackers don’t get stale as quickly. This means you can pack lunches further in advance, which is a big plus. Here’s one little boy who’s happy about being able to have a good snack on the go! The containers don’t “snap” closed or seal tightly, to make it possible for children to use them easily. The cooler bag keeps them upright, or you can put an elastic around the container to keep it shut in a backpack. 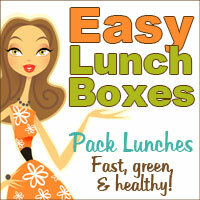 You can also buy EasyLunchboxes on Amazon, where they qualify for Free Super-Saver Shipping. EasyLunchboxes are the #1 best seller in the category “lunch boxes” on Amazon.com! Disclosure: Our reviewer received a product as a giveaway win. I like that they sounds pretty sturdy for prolonged use and are BPA free too! I want this because for my husband’s lunches [or mine when I work at the hospital]. i like how the containers are divided and they fit well in the cooler bag and that they are BPA free. I like that it has Easy-Open, Kid-Friendly Lids! This would be perfect for my toddler’s lunches!! I like this because we pack 3 lunches a day and this would be convenient!! I love everything about them!! All the food stays seprate and the awesome cooler that comes with it too!! It would be perfect to send to school with my kids!! I like the Olive Cooler!! I love the photo gallery with ideas for what to pack! I think these would be great for packing lunches for me and my toddler. I’m always sticking half a dozen different containers into our bag. I like that they hold adult-sized portions.